Originally intended as a "throwaway" track written to complete the album, the song became Sheik's breakout hit, entering the top 20 of the U.S. Billboard charts, peaking at #16, and remaining on the chart for 55 weeks. "Barely Breathing" also hit #19 on the Hot Adult Contemporary chart. At the time, it was the fourth–longest–running single in the Hot 100. It ranked #88 on VH1's 100 Greatest Songs of the 90s, and #8 on their 40 Greatest One-Hit Wonders of the 90s list. Additionally, "Barely Breathing" earned Sheik a BMI Award for Most Played Song of the Year in 1997 and a Grammy nomination for Best Male Pop Vocal Performance in 1998. The song was covered in a 2012 episode of the American television series, Glee. ^ Whitburn, Joel (2002). Top Adult Contemporary: 1961-2001. Record Research. p. 220. 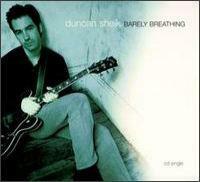 ^ "Hip Online: Artists: Duncan Sheik". Archived from the original on 2006-10-31. Retrieved 2006-12-26. ^ "Duncan Sheik: CV". Archived from the original on 2006-11-29. Retrieved 2006-12-26. ^ "Barely Breathing (Glee Cast Version)". Amazon.com. Twentieth Century Fox Film Corporation. Retrieved September 20, 2012. ^ "Duncan Sheik Chart History (Hot 100)". Billboard. Retrieved March 26, 2011. ^ "Duncan Sheik Chart History (Adult Contemporary)". Billboard. Retrieved March 26, 2011. ^ "Duncan Sheik Chart History (Adult Pop Songs)". Billboard. Retrieved March 26, 2011. ^ "Duncan Sheik Chart History (Pop Songs)". Billboard. Retrieved March 26, 2011. ^ "RPM Top 100 Hit Tracks of 1997". RPM. Archived from the original on 2017-08-05. Retrieved November 26, 2017.